Brian Hare, dog researcher, evolutionary anthropologist, and founder of the Duke Canine Cognition Center, and Vanessa Woods offer revolutionary new insights into dog intelligence and the interior lives of our smartest pets. In the past decade, we have learned more about how dogs think than in the last century. Breakthroughs in cognitive science, pioneered by Brian Hare have proven dogs have a kind of genius for getting along with people that is unique in the animal kingdom. Brian Hare's stunning discovery is that when dogs domesticated themselves as early as 40,000 years ago they became far more like human infants than their wolf ancestors. Domestication gave dogs a whole new kind of social intelligence. This finding will change the way we think about dogs and dog training indeed, the revolution has already begun. Hare's seminal research has led him to work with every kind of dog from the tiniest shelter puppy to the exotic New Guinea singing dog, from his own childhood dog, Oreo, to the most fashionable schnoodle. 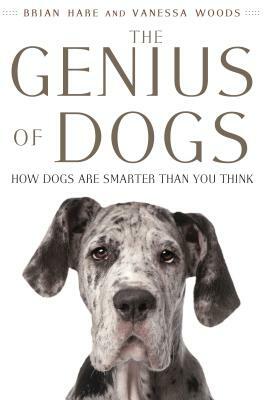 "The Genius of Dogs" is nothing less than the definitive dog book of our time by the researcher who started a revolution. BRIAN HARE is a professor of Evolutionary Anthropology at Duke University, where he founded the Duke Canine Cognition Center. VANESSA WOODS is a research scientist at the center as well as an award-winning journalist and the author of "Bonobo Handshake." Hare and Woods co-founded Dognition.com, a service that helps you discover how your dog thinks. They are married and live in North Carolina.